Maruti’s Ciaz diesel has always been the go-to choice for an overwhelming number of C-segment sedan buyers. But while the car in general was faultless, the engine lacked the punch to match its competition. To keep up with its competitors, Maruti has given the Ciaz a brand new 1.5-litre diesel engine now. Produced by Maruti in-house, the DDiS 225 is more powerful and torquier than before, a jump of 5PS and 25Nm from the 1.3-litre DDiS engine. The Ciaz remains the same in terms of features and dimensions, and to check out the thorough comparison head here. With the addition of the new DDiS 225 engine, will the Ciaz edge past its competitors in terms of performance? Let’s get down to business and see how it stacks up against its competition on paper. The main change for the Ciaz is under its hood. It gets a brand new in-house-developed 1.5-litre DDiS 225 engine. The engine produces 95PS of power (the least in this comparo) but beats the Honda City, which produces the least torque here, by producing 25Nm torque more. The City produces 100PS of power, which should serve you adequately. Hyundai’s 1.4-litre CRDi Verna has the lowest displacement here and on paper, the lowest power output as well. But the torque output is better than the Honda and is almost close enough to the new heart of the Maruti. The second engine option of the Verna has the biggest engine, displacing 1.6 litres. The Hyundai’s 1.6-litre oil burner produces 128PS and a healthy 260Nm of torque, making them the class best. Following up closely is the German duo, which produces 110PS and 250Nm of torque, with the Vento having a slightly bigger torque curve. The Ciaz now gets a 6-speed manual transmission compared to the 5-speed unit of the earlier car. Even the City and the Verna also employ 6-speed units whereas the Vento and Rapid make do with a 5-speed one. The Verna, Rapid and Vento also get an option of an automatic, with the first one coupled with a 6-speed torque converter AT and the latter two with a 7-speed DSG. Talking about “Kitna deti hai?” the Ciaz has the highest claimed FE in this comparo by offering 26.82 kmpl. Following closely behind is the Honda City by stretching a litre of fuel for 25.6 km. Coming up next is the Verna 1.4 with a mileage of 24.80 kmpl. Surprising to say that the 1.6 Verna almost matches the 1.4 Verna in the fuel economy department by offering just 0.05 kmpl lesser than its 1.4 sibling. Coming at last is the German duo. That said, when you prefer the automatic variants, the plot twists as the Rapid and Vento take lead by offering you 21.66 km and 22.27 km for a litre of fuel, respectively. Part of the reason is due to the 7-speed DSG, which is more precise and adapts to your style of driving. Thus they provide a good balance between performance and efficiency, which helps the Germans claim better figures than their Korean counterpart, which comes with a 6-speed torque converter. The Verna does 21.02 km for a litre of fuel, which is not bad. 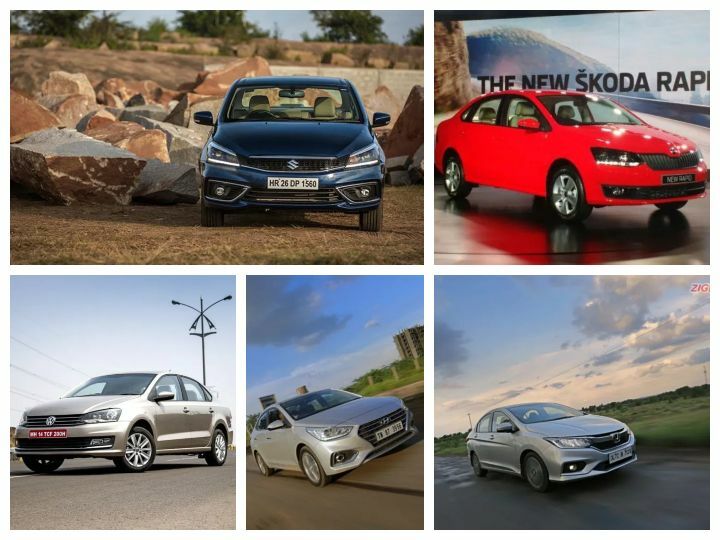 Talking about pricing, the Ciaz is the cheapest one in this bunch. Though the base variant doesn’t undercut the German duo, the rest of the variants undercut the others comfortably. The same can’t be said about the Honda with its steep pricing and no automatic variants on offer. That makes the City MT the most expensive in this comparo. The German duo play middle ground here by having a variant for everyone at different price points. Though, as you move up the lineup, things start to get pricey here. The Verna 1.6 is a good bet here, with a plethora of features on offer. However, if you want the Verna with a slightly cheaper price tag and don’t mind settling down for a 1.4-litre engine, its base variant makes a good value for money proposition. So what would you pick among this lot? Do let us know in the comments section below.